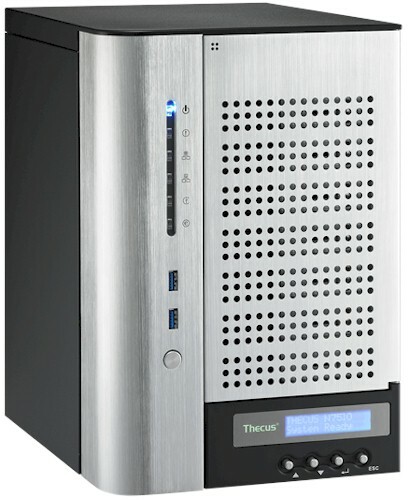 Summary D2700 Atom-based seven-drive high-performance BYOD NAS with USB 3.0, HDMI & audio I/O ports. Thecus has been spiffing up its SMB NAS family with processor upgrades and media playback features like HDMI and analog audio I/Os. A few months back, we looked at the five-bay N5550, which brought a Intel D2550 Atom CPU to Thecus' five-bay SMB offerings to spiff up performance a bit. Today, we're looking at an opposite approach with the N7510. This time, Thecus' aim is to provide a more affordable option for fans of its seven-bay NASes. The N7510 is essentially an N7700PRO, but with a 2.13 GHz dual-core Intel D2700 Atom instead of a Core 2 Duo. The N7510 stands taller than most other desktop NASes that come across the SNB test bench. But Thecus' seven-bay chassis hasn't changed since we first saw it in the N7700. The front door still has is secured with a push-push latch and no lock. And each of the drives sits in a lockable tray that has light pipes to carry power and activity / error lights forward from the drive backplane. Because the drives are behind the door, you still don't get a clear view of these lights when the door is closed. The front panel callout diagram above hasn't really changed since the N7700 either, except that the two front panel USB ports are now 3.0 instead of 2.0. I wish one of the ports were on the rear, to make cabling cleaner to a backup drive that might be connected for awhile.